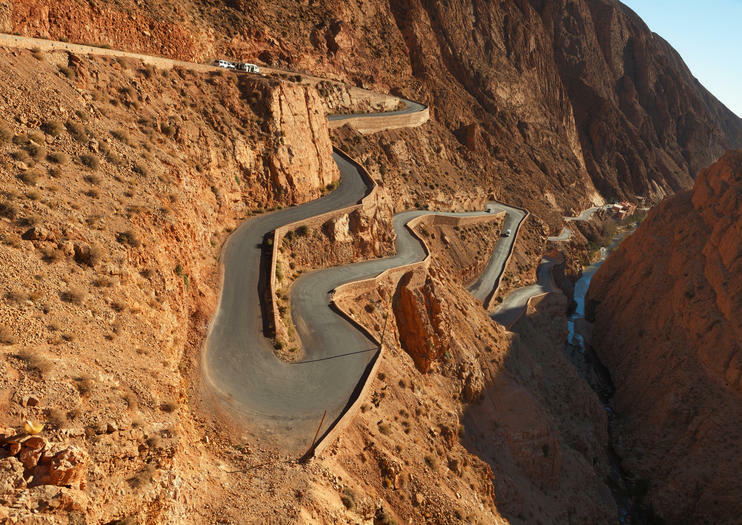 A winding strip of blacktop known by locals as the “Road of a Thousand Kasbahs” leads to the famous Dadès Gorge in the beautiful countryside of Morocco. This scenic drive is lined with hundreds of Islamic cities, fortresses, palm trees and desert sands, which make it one of the most epic roads in the country, but traveler say it’s the rolling red hills of the Dadès Gorge that are truly worth the trip. After navigating switchbacks by car, visitors can wander the quiet trails of this scenic destination on foot and enjoy a steaming cup of Moroccan mint tea at the top of the gorge. Breathtaking vistas and uninterrupted views of rolling read rocks make for a memorable resting place and quiet escape before embarking on a return trip to the city. Dadès Gorge is located between the Atlas Mountains and Jbel Saghro of the Anti-Atlas range. The access road is roughly 40 kilometers long and provides stunning views of the surrounding landscapes. Beautiful discovery of the great south of MoroccoHead to the famous dunes of Merzouga where the horizon has no limits! This small group tour start from Marrakech and continues to Merzouga in the south side of Morocco and continue to Fes for 3 days and 2 nights with half board breakfast and dinner. You will visit some of the most interesting sites in Morocco, such as Ait Benhaddou Kasbah, the magnificent Dades and Erg Chebbi sand dunes, the gigantic oasis of date palms of Ziz Valley, crossing the High and Middle Atlas Mountains, the Atlas Cedar Foresta. This unique tour from Marrakech to Fes desert tour allows you to to thoroughly experience Morocco's Nature. Travel from Fez to Marrakech through Morocco’s magnificent Atlas Mountains and Sahara Desert on a 3-day tour that features an overnight in a Berber camp. Turning the long drive into a classic Moroccan adventure, this desert tour includes some of the country’s top experiences: you’ll ride camels through the dunes, walk through towering gorges, and discover the UNESCO World Heritage Site of Ait Benhaddou, and more. While short excursions can provide a glimpse of Morocco’s desert environments, multi-day tours offer much greater insight into Berber and nomadic traditions. With this adventurous multi-day tour, explore the High Atlas region, stopping at kasbahs, Berber villages, and a film studio, along the way. Spend the first night in a riad in the Dadès Gorges, and the second at a desert camp in Merzouga. Discover the vast Sahara Desert on this 3-day tour from Marrakech to Merzouga. Visit attractions such as Ait Ben Haddou, Ouarzazate, and the Dades and Todra Gorges, along the way. Enjoy camel rides at sunset, spend the night in a traditional Berber tent, and take in the incredible desert sky at night. Explore the wild landscapes of the Sahara Desert on this 3-day adventure from Marrakech and travel much further than is possible on a day trip. Visit Kasbah Ait Benhaddou and Ouarzazate, admire the dramatic scenery of the Dadès Gorge, trek through the Sahara desert on a camel, and spend a night at a traditional Berber camp in the desert. Planning a trip in the Moroccan desert can be quite stressful. Avoid the hassle of planning your trip by joining this 3-day desert tour to Merzouga from Marrakech. Pack in camel rides and a desert campfire with stops in and sightings of places such as Erg Chebbi, Ait Ben Haddou, Ouarzazate, Todra Gorge, and the Draa Valley. Plus, two nights of accommodations and round-trip transport is included. Skip the big group tours and enjoy a more personal experience on this small-group three-day excursion. Travel from Marrakech through the Atlas Mountains to see oases, Berber villages, and the dunes of the Sahara desert. For an adventurous way to get from Marrakech to Fez, take this 3-day, one-way tour through the High Atlas Mountains, spending two nights along the way—one at a guest house in Dades and another under the stars at a Sahara desert camp. Activities and attractions include Berber villages, visiting a kasbah, riding a camel, driving along Roses Valley and the road of 1001 Kasbahs, and walking through an oasis to Todra Gorge.